When India pledged its commitment to reducing its GHG emissions in the Paris Agreement, it was apparent that the focus would be on clean energy expansion in the country. With the cost of renewable energy at an all-time low, clean energy security is now the political and foreign trade focus in India. Solar, wind, clean coal, nuclear and hydropower policies will contribute to reducing emissions and may help achieve the long-term goals of the Paris Agreement, as may green transport, waste to wealth and solid waste management systems. However, mitigation strategies will not entirely answer India’s ambition for climate justice within the country, without the critical application of adaptation initiatives. Climate change is a ‘threat multiplier’, intensifying pressures on the livelihoods of 700 million people in rural India that depend on climate-sensitive sectors. They need options and techniques linking climate science with local conditions to adapt in crucial sectors, such as sustainable use of land and water resources, forestry and biodiversity. Thus, the focus of seven of the 12 Climate Change Missions on Adaptation and a National Adaptation Fund of 55.6 million USD becomes significant. The rural community is alert to the disruption climate change brings to their crops, water resources and eco systems. However, they need capacities to develop consultative adaptive options; and to advance adaptation strategies and techniques as lifelines, there is a need for innovative communication approaches. Access to modern communication modes is limited in rural areas, and there is no universal methodology for climate change communication which can lead to behaviour change. This is why verbal communication and engagement remain the most powerful means for participatory communication. One such communication innovation has been the coming together of communities, scientists and policy makers, at the district level, for the co-production of content through a process of dialogue for engagement. It is inspiring to imagine the power of science blended with local experience to create contextualised content for local adaptation solutions. 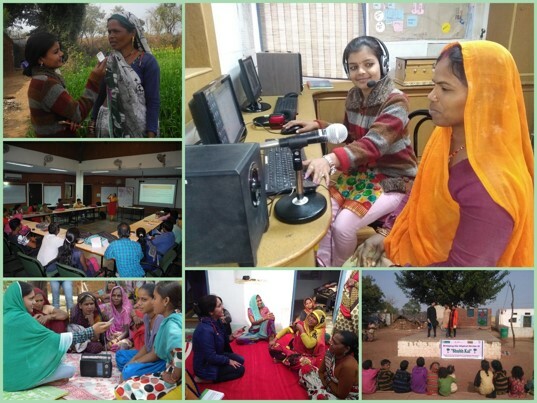 Shubh Kal (for a better future) campaign on climate risks and adaptation solutions broadcast by role models on community radios in Bundelkhand is one such initiative. Its approach is not to use fear, but the nurturing of engagement with methods and tools that are gender-sensitive, participatory and simple. Community interactivity and participatory dialogue, street theatre and puppet shows, competitions, IEC material and training are used as engagement tools. The result is a number of women, youth and farmers in over 200 villages getting enabled to catalyse climate change awareness and understanding. This Shubh Kal campaign has expanded in over 800 villages. The aim is to strengthen livelihoods of rural communities in this climate vulnerable region. The accessibility, flexibility and potential for inter-cultural communication have made the Shubh Kal campaign a model to emulate. Maybe it is just a process, but it is a process for change. With a communication approach that uses dialogue for engaging rural communities, there is every probability that there will be behaviour change. Therein, lies the path for ‘dialogue to engagement’.